To offer your support to Save Woodlawn Stabes visit the "Get Involved" tab. All letters are available to be downloaded in .pdf form at the bottom of the page. 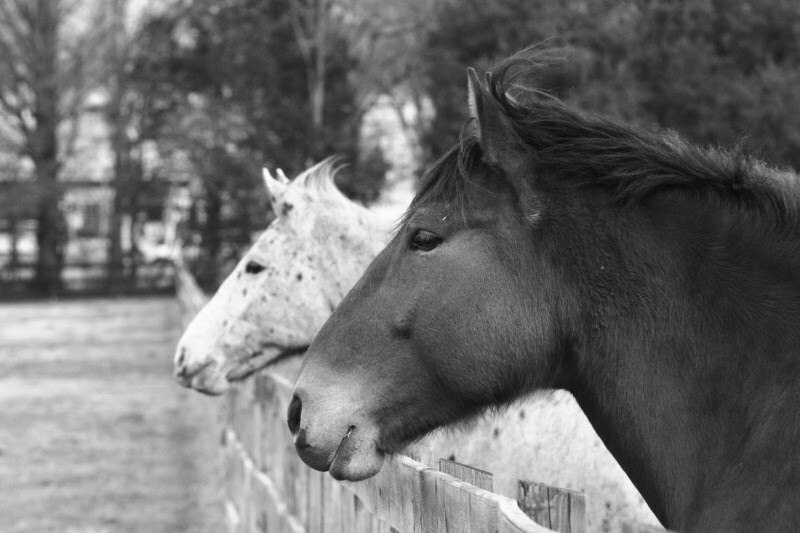 A letter of support from the Northern Virginia Coalition of Equestrian Organizations (NVCEO) supporting the widen in place option to preserve Woodlawn Stables and as such, a place where local and military families can enjoy equestrian sports. Letter from State Senator Adam Ebbin to the Federal Highway Administration voicing his concern that the process has not been completed in the best interest of concerned parties, historic preservation, environmental studies and the community. Letter from State Senator Adam Ebbin to the National Trust for Historic Preservation Board of Trustees requesting that they engage closely with all affected parties, Woodlawn Stables included, so all of Woodlawn Plantation can be preserved together. Letter to the Federal Highway Administration and VDOT from Mount Vernon District Supervisor, Gerry Hyland supporting the "Widen-in-Place" option as the least damaging option. Visit Supervisor Hyland's "Hot Topics" page to see his opinion on his page. Joint letter from Stat Senators Toddy Puller and Adam Ebbin and State Delegates Scott Surovell, Dave Albo and Mark D. Sickles supporting the "Widen-in-Place" option to "best preserve the historic character of the Woodlawn Community, preserves the existing use of historic areas and can be done in a manner to most minimize harm to our community's historic assets." 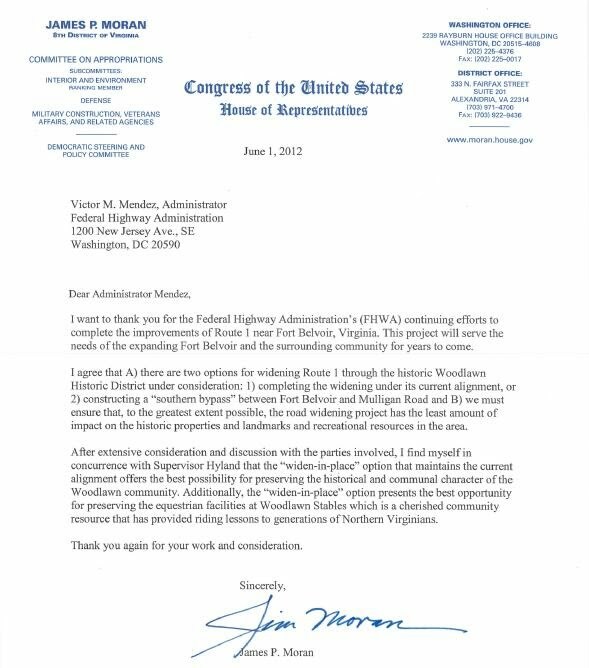 Letter to the Federal Highway Administration from Congressman Jim Moran Supporting the "Widen-in-Place" Option and Save Woodlawn Stables. Letter from Congressman Gerry Connolly to the Federal Highway Administration requesting they preserve Woodlawn Stables as one of the last two equestrian facilities in the area. A poem by Meredith Layman written from a future perspective in which the stables has been paved over. I remember the horse, though. With any of my own friends. Instead, I met nine new friends. No one but the flies. The long, hot, August week. Went back home, I was happy. I found myself drawn there. Even as sweat trickled across my brow. And it soon became my hobby. I could spend with the horses! I have to be a team with the horse. No, not the horse, my partner. When he was scared, or happy. He could sense me, too. But the horses kept everyone warm. At least, that’s how I felt. We would see deer, turkeys, groundhogs. From the busy, roaring road. That’s how it was for a while, and I was happy. Green grass, yellow buttercups, golden horses. But that’s how it was. But the barn is gone. But then a car horn kills that dream. Those were ruined by a road. That used to be home to 40 horses. A Letter to the Editor in the Fairfax County Times.